The first official meeting of Welly-moot was a total success, as all who attended would agree. Instead of As well as the usual chaotic, coffee-drinking, cake-eating, gossip-mongering sessions of 2011, we also managed to stick to the announced theme ("How Gandalf ended up with the Key and the Map"). Speaking of Gandalf - we had two Gandalfs present at the meeting! 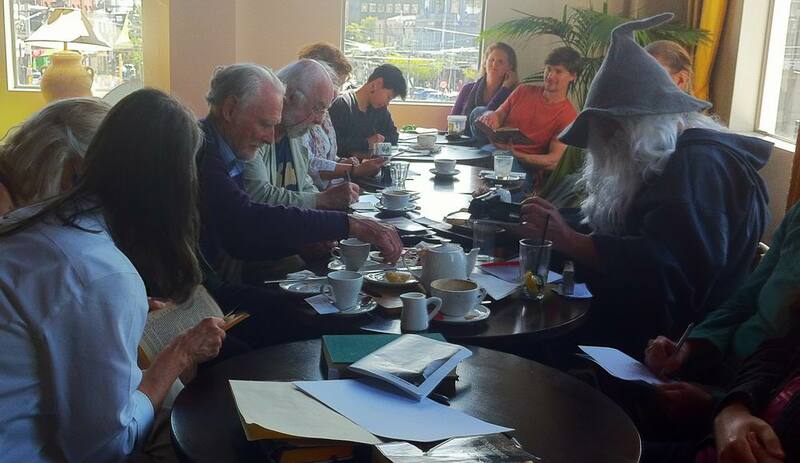 I had received word that Jens Goetz from the German Tolkien group Tolkien Stammtisch Rhein-Main would attend, however we were all amazed when he walked in to the meeting in full Gandalf the Grey costume! Well done and well met, Jens, and a pleasure meeting you! Tolkien Societies reps - Mervi from Finland, Jens from Germany, and myself. We are the hobbits, my friend. Cause we are the hobbits. And eat till the end. I mentioned TWO Gandalfs - I'm not sure how clear this was to everyone there, but also present at the meeting was Michael Elsworth, who doubled for Gandalf in the LOTR movies. According to his very brief page on IMDB, he was also the Gondorian Archivist who helps Gandalf get to the library in Minas Tirith in FOTR. 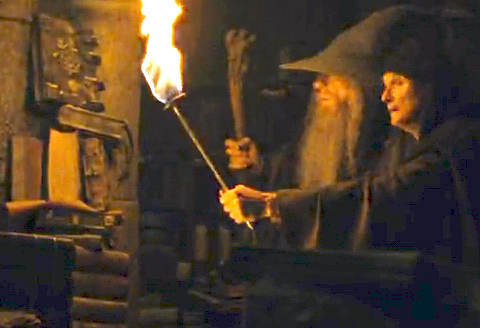 Careful with that torch in a library! What isn't clear on his IMDB page is that he was also Cirdan the ship-building Elf who originally receives a Ring of Power from Sauron in the Prologue of FOTR. This means Michael was not only one of the first three people on screen - he was also the only person to wear a Ring of Power as two separate characters (since Cirdan eventually passes the Ring on to Gandalf)! Unfortunately Michael had to leave the meeting slightly earlier than I expected, so I did not get a chance to properly introduce him to the group. Hopefully he will grace our meetings again, and I will correct my inadequacy! Kris and I had planned to discuss the format and content of the meeting properly beforehand, but we have both been very busy lately and the discussion just hasn't eventuated. Luckily, since Kris is a trained as a teacher, she didn't wait for me to begin. She started the discussion by handing out blank paper to anyone who wanted to take notes on the session. Kris had arrived to the meeting with a good sized bag full of Tolkien books. Among them were The Return Of The King, the Unfinished Tales, and The Letters Of JRR Tolkien. 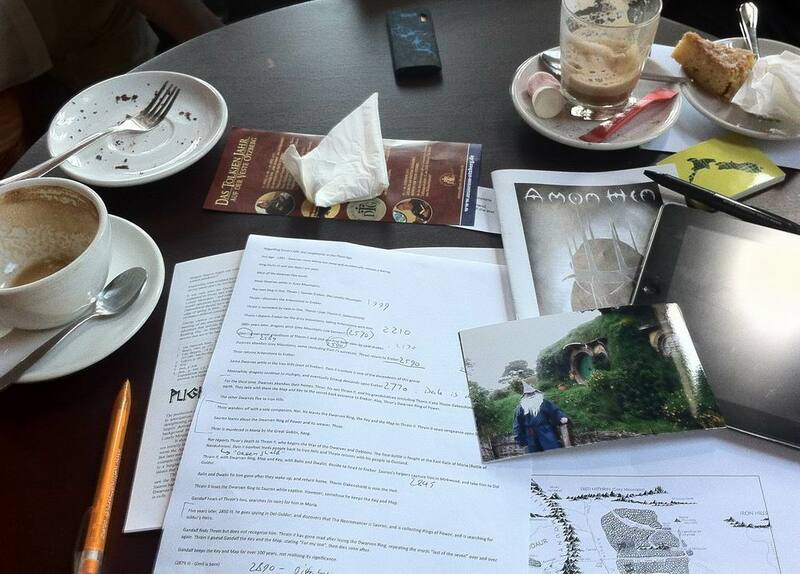 Using the Appendices of ROTK, Kris took us through the events leading up to the meeting between Gandalf and Thorin Oakenshield, that fateful day in the Prancing Pony. I had also prepared a few notes, and I had brought a small map of the relevant areas in Middle-earth, so Kris and I filled in each other's omissions. The complete timeline will be published here just as soon as Kris and I have a complete (and agreed upon!) version of it. Watch this space! 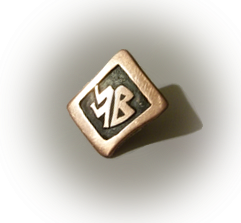 I've been in touch with the UK Tolkien Society about reprinting Mark Bednarowski's excellent articles on the subject, and Mark has gracefully granted this, so I will provide those here online as well. Best moment of the afternoon - Kris finished her timeline off with "...and finally, Gandalf stands in front of the round green door in the Shire, and that..." (points at Jens in Gandalf costume) "... is where you come in!" Jens immediately responds with "Yes - would you like to see a photo of that moment?" Jens's photos certainly brought home the reality of living in Middle-earth New Zealand. All in all there was a really good turnout. Ryan and Jenifer brought little Hawk along (he's getting less little every meeting!). After a year of Facebook contact, and a month after her arrival in NZ, I finally met Charlene, and she'll be coming on a LOTR tour with me in the next week as well. My partner Alex had invited Viv, a friend of hers, from her current workplace. Martyn had brought Michael and Rachel. Mervi from the Finnish Tolkien Society again managed to make it to Wellington from her NZ travels, and Ayako and Randall drove all the way from Palmerston North with their delightful daughter Rio and her friend Akari. It was nice to see Kumi again, but John and Jo I hadn't met before and I hope will join us again for the next moot. And with Jens "Gandalf" Goetz from Germany, and Kris and myself, that made 20 Welly-mooters. I hope everyone enjoyed it as much as I did - I'm looking forward to our next meeting, which will be on the 29th of April, 2012. I will announce the next meeting's theme in the next few weeks, as soon as Kris and I agree on it. We're taking suggestions!